No one enjoys thinking about all the things that can go wrong. Ask any estate planning lawyer or life insurance salesman. But planning and preparation are vital components of everyday life. We all know death is inevitable, so the aforementioned topics are typically ones we eventually make ourselves address. Car accidents may not be inevitable, but they certainly are common. The National Highway Traffic Safety Administration reports that more than 2 million people were injured in passenger vehicle accidents in 2012. This was an increase of 6.3% over the previous year. These numbers indicate that chance are you or someone you care about will eventually be in a car accident. Clearly, the best course of action is to drive safely, follow the rules of the road, don’t engage in dangerous or distracting activities while driving and stay aware. Unfortunately, even if you follow this advice, someone else’s negligence may defeat your efforts. So, it’s advisable to be prepared should you ever be involved in a car accident. Your first course of action is to check for injury to yourself and others. Stay calm and rational. Act don’t react. If you believe that you or anyone else involved is hurt, call 911. Shock and emotion may mask your initial symptoms, so it’s important that you seek medical attention even if you don’t believe you have suffered any serious injuries. Immediate medical treatment can make a world of difference in your recovery. As long as you are physically able, without jeopardizing your health and safety, document the scene of the accident. Record the road conditions, visibility, weather and time. Take photos of the vehicles involved in the accident, the area of the collision, and any road signs or hazards. Exchange the necessary information with the other driver(s). Typically this include your contact info, driver’s license and insurance. If you can safely approach witnesses, do so to obtain their contact information as well. Be careful about what you say. Never admit fault, even if you believe this to be the case. There may be mitigating factors you are unaware of that contributed to the accident. Even statements of concern can be misconstrued. If there is more than $500 in property damage, death or injury, New Jersey law requires that you report the incident. Contact the authorities and stay on the scene until they arrive, unless you have a reasonable belief that it is unsafe to do so. Request that the responding officer file a police report. 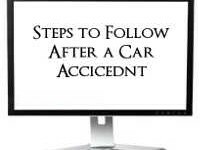 Notify your insurance company of the accident as soon as possible. Once everyone is safe, needed medical attention has been sought and law enforcement has been notified, it may be time to call a Car Accident Lawyer. Even if you believe the accident is a mere fender bender, the other party may not see it that way. Protect your rights by seeking legal counsel right away. During your free initial consultation, your attorney will review the circumstances and offer his legal opinion.